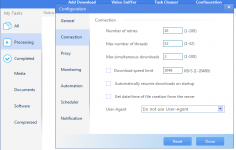 EagleGet is a natural application for downloading one or more files at once with high speed. EagleGet is a practical, elegant and simple solution to download one or more files at once with high speed. It perfectly integrates with your browser - Chrome, IE or Firefox, allowing you to download all types of files and videos from streaming video sites, just by copying the URL to the clipboard. The application supports many protocols including FTP, RTSP, HTTP and HTTPS and allows downloading multiple files simultaneously. It also includes a manager that organizes the downloaded files - software, documents or media, facilitating their removal directly. Using the technique of drag and drop, you can prioritize certain files and can also schedule a download. It also provides assistance in case you want to download large files from the web in no time.